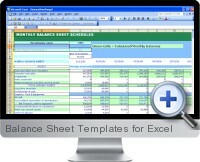 Balance Sheet templates for Excel provide 12 monthly linked balance sheet templates which always balance. 12 month profit and loss schedules and cash flows (source and application of funds) can be created quickly and easily which automates all the figures in the 12 monthly balance sheets. Balance Sheet templates for Excel is ideal for turning monthly profit and loss forecasts or last 12 months data into monthly and year end balance sheets and cash flows. Monthly inputs of Unit Volumes/Prices/Cost of Sales and Company Expenses (100 rows) can be entered. Further quick and easy working capital and fixed capital templates provided. The balance sheet templates balance by transferring changes that occur between successive monthly periods into the monthly cash flow schedule. The cash flow schedule tracks changes that take place within all twelve balance sheets and this calculates the balancing cash position at the end of each month. 12 month financial data (historical or forecast) can be transformed into income schedules and balance sheets to display to management, investors, lenders, and banks. Balance Sheet templates for Excel are delivered with separate Excel files A and B (to fit specific purposes), plus a tutorial version. Version A provides a forward looking planning suite which accepts monthly unit volume forecasts, different product prices and cost of sales for the 12 month period and a monthly company expenses forecast. Predictions can then be made for sales days outstanding, inventory levels and percentage of sales supporting receivables. Version B provides an historical suite that converts unit sales, revenues and company expense data into monthly balance sheets and income schedules. The program calculates average price yield per product, average cost of sale, and monthly break even volumes. Values can then be entered for actual sales days outstanding, inventory levels and percentage of sales supporting receivables. The currency can be set to any symbol by opening the Format menu in Excel and selecting Cells from the drop down list, which produces the Format Cells table. Click Currency and then choose the currency to work with from the Symbol panel.